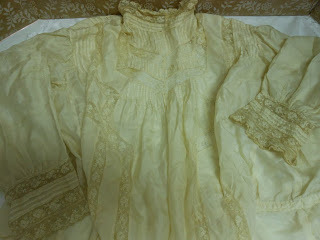 STUNNINGLY BEAUTIFUL ANTIQUE SILK AND LACE BLOUSE. COTTON FRENCH LACE IS IN MINT CONDITION. SILK HAS A FEW ISSUES...A FEW TINY PIN HOLES AND A FEW TINY AGE STAINS. THIS BLOUSE IS LOADED WITH PINTUCKS AND BEAUTIFUL LACE INSERTS. 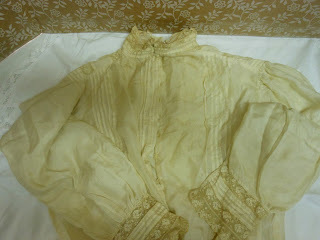 ALL ORIGINAL BUTTONS AND HOOKS AND EYES ARE INTACT. 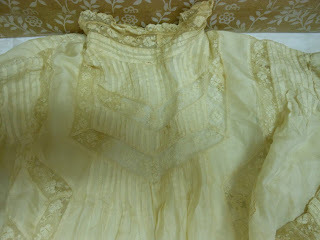 IT HAS AN IVORY AGE PATINA AND NEEDS A GOOD SOAKING, WHICH I WILL LEAVE TO THE BUYER. BEING SOLD IN "AS FOUND" CONDITION. IT IS A GREAT PIECE FOR TEACHING, DISPLAY, OR TO WEAR. SO LOVELY TO ADD TO YOUR COLLECTION OF ANTIQUE CLOTHING. SHIPPING IS FREE FOR THIS BEAUTY. THANKS FOR LOOKING AND I HOPE YOU WILL RETURN OFTEN. I love the trim placement on this. Very Edwardian in style - notice the loose bottom front and the fitted back? 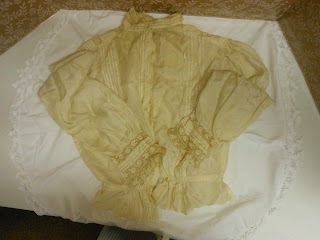 Pigeon front blouse or shirtwaist. The seller mentioned that the silk blouse needs a "good soaking"...now don't get me wrong, but I've been cleaning up the antique garments in my town's museum and my intuition says to NEVER let water near silk? It depends. Spot cleaning silk with water is best but sometimes - as the dress I have hanging upstairs is evidence of- the entire outfit just needs to be put into a bath of oxyclean and water. I'd be very careful but, in this case, I'd put it on a window screen (cheap and easily available at any home improvement store), soak it for a couple of minutes in a mix of oxyclean and water, pick it up, drain the bath, put in clean water, re soak it while gently pushing away the soap from the garment, and then lay it out on the screen while letting it dry in a cool room. That's assuming there is some sort of smell/dirt issue and it's not just yellowed with age.